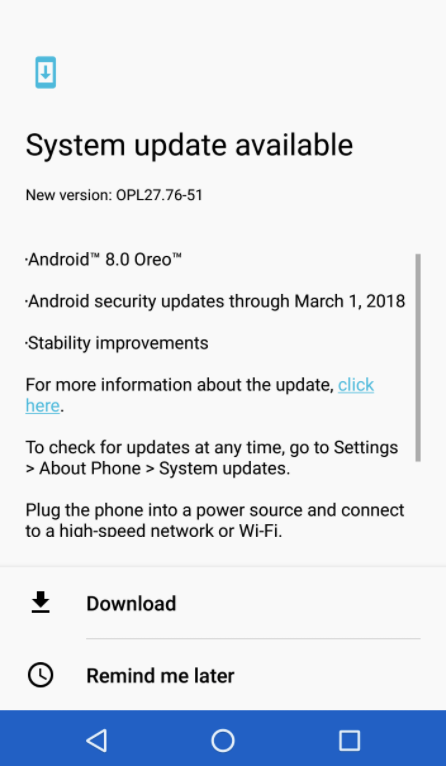 Update [April 21, 2018]: The Oreo OTA is hitting users in the UK as well as Canada. It’s been about a month since the first stable version of Android Oreo started rolling out to the Moto Z, but this was only limited to the Brazilian market. Now, those who purchased the handset in Europe can speak the same language as their South American counterparts thanks to an update that has just been spotted in the region. Coming in as software version OPL27.76-51, the update also tags along a new security patch for the month of March 2018, which isn’t the latest available. Besides Android Oreo and security patches, Moto Z users will also enjoy stability improvements and bug fixes once the new update is installed. Will the Moto Z get Android P? As an over the air update, it will take time before every Moto Z user in Europe gets the OTA notification. If you can’t wait for it, which shouldn’t be long before it arrives, you can try a manual update via the Settings menu. Have you received Oreo on your Moto Z handset? If yes, feel free to share some of your first impressions in the comments section below.